Of all the cupcake-liner fun I had, this project is probably my favorite. It’s cupcake liner fortune cookies! They’d be great for baby showers, parties, weddings, or as a surprise in someone special’s lunch. 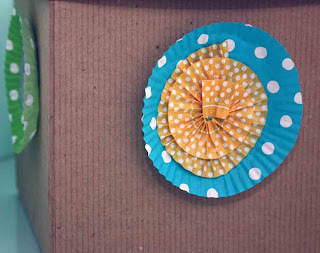 Fold a regular cupcake liner in half. Stitch (I used a sewing machine) around the outer edge of the liner. With your finger, push the center up to create the fortune cookie shape. 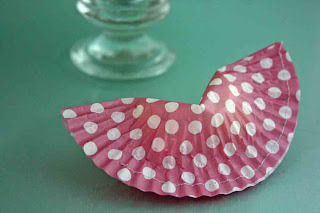 This is probably the easiest of my cupcake-liner projects. They’re bottle wraps. Simply remove the circle from the center of the liner and put the skirt around a bottle. Forget about marking your drinks at a party with a marker. This approach is cute and quick! Have a gift that needs wrapping? 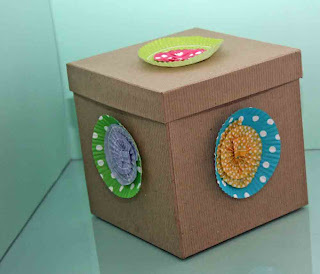 Use cupcake liners to dress up an ordinary gift box. Simply cut liners down so that the edges are short. Use the area you trimmed off to create a decorative center by twisting and gluing it into a spiral in the center. Note: Cupcake liners are slick (so the cake won’t stick to them), so you’ll want to use a strong glue. I used Fabri-Tac by Beacon’s. Hot glue would work as well. 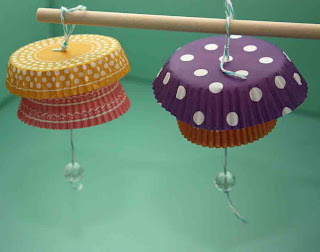 These dangle-y delights are simply threaded cupcake liners. Used a needle and some baker’s twine to string them up. I started with a smaller liner and put a regular liner on top of it (with the edges cut down). You can string up one or add a bunch to a single string. I have one more project to share, a card, which I’ll post on Friday. In the meantime, you can watch my recent TV segment on these crafts here. And you can check out my past segments on the Creating Keepsakes website. Thanks! I love these SO much! Those fortune cookies are genius. Thanks so much for the fabulous idea, I'll be linking. 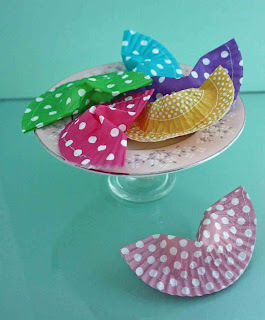 I love it and must try it..
How cute are those fortune cookies in polka dots, so dang clever. Love it! So clever you are. I posted a link on ediblecrafts.craftgossip.com. These are great ideas! 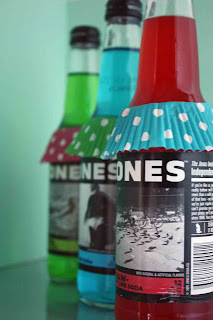 Love the fortune cookies and the bottle skirts. I've been rackin my brain ( which with all the blogs, why would I hurt myself?) tryin to figure out what to use for my daughter's college graduation as a cute little treat! These fortune cupcake liners are genious. Thanks for saving my brain from exploding. :0 I'm gonn tuck in some well wishes with the mints. THANKS SO MUCH I'LL BE LINKING THIS with your permission some time in November. Oh my, those fortune cookies are ADORABLE! Might need to try my hand at those...thanks for the inspiration! Just LOVE those fortune cookies - super clever and they look great! I LOVE the fortune cookies! I think I just found my wedding favors!! What a genius idea! Support Breast Cancer and Bid!